Surely one of the greatest summer joys is to wake naturally as the skies begin to lighten? Lying silently, one listens as nature’s volume control slowly cranks up almost imperceptibly, as bird after bird launches into song, each the distinctive trill of a territorial male proclaiming ownership of a particular bush, shrub or tree. But while we may thrill to the sound, few of us can distinguish the individual species, not least because most are almost identical: small, thin-beaked and drab. These are the warblers, a large, but visually undistinguished group, but still genuine ‘diamonds in the rough’ . . . This means the simplest identification key is the song. Each species has its own unique call, a fact that allows most species to forego gaudy plumage for the safety of camouflaged grey, brown, olive or yellowy-white. This leaves the bird watcher with a problem for Britain hosts a score of this appropriately named family. As well as drab colours, they share the same slender beaks and most are migratory. As a result, it was not until the late 18th century that one of our greatest amateur naturalists, Gilbert White, first spotted the difference between the otherwise identical wood and willow warblers. A talented musician when not observing nature, he noted local song birds with distinctive songs were not responding to each other. From this he deduced they were separate species. Unfortunately, he was forced to prove his conjecture by killing his subjects, but today the beginner can turn to the far more humane resorts of the CD and internet. The birds choose to avoid the rigours of our winter by passing the colder months in the Sahel (the region just south of the Shahara), but at about Easter they begin to return, timing this to coincide with the warmer weather and longer days that lead to the explosion of insect life in our woods and fields. As the first tender, juicy, shoots emerge, insects emerge from hibernation to indulge in a reproductive frenzy and the birds are on hand to cash in. Better still, our days are much longer than those in the Tropics, giving vital extra hours to find food for one or even two broods. 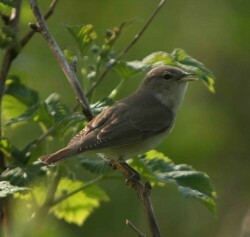 Later in summer warblers are omnivores: quite happy to feast on hedgerow fruit, but during the breeding season, they focus almost exclusively on creepy crawlies, eating prodigious quantities of flies, caterpillars and grubs, performing a valuable service to gardeners. So while most of our attention is focussed on the fantastic melodies pouring out of the trees and hedgerows, the birds are hard at work plucking insects from the foliage to supply their ever-hungry broods. These need a constant supply of insects to build those rapidly-growing bones (most two week-old chicks actually weigh more than either parent). As a result each parent will harvest up to 500 creepy crawlies a day to nourish their brood. The thought that these natural choristers are also unpaid pest controllers must, surely, be the icing on the summer dawn chorus cake. The British Trusst for Ornithology has a good website (http://www.bto.org) and produces an excellent Garden Birdwatch gift pack (£12 including P&P from The Nunnery, Thetford IP24 2PU, 01824 750050). The RSPB’s website has a good species list with online recordings of song and it also sells a range of books, CDs and tapes to aid identification. Try http://www.rspb.org.uk or phone 01767 551 .